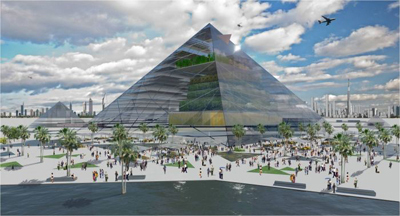 Vertical Farming - Could It Really Work? Humanity has always looked to the skies - skyscrapers, aircraft and space ships are physical manifestations of that desire. As our planet gets ever more crowded, how are we going to find the agricultural land to continue feeding people? As the old joke goes: "They're not making it any more." 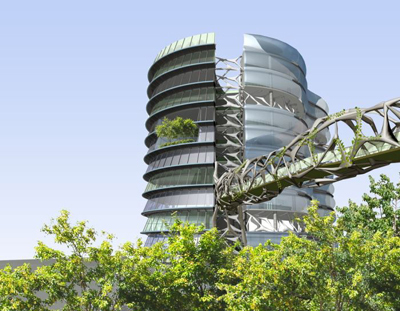 One suggestion has been "Vertical Farms" building artificial farms in tall buildings. It is wild, whacky, and on the fringes of science. So of course were skyscrapers, aircraft and space ships.....once. Is it a practicable idea? The Economist thinks not. Recently it devoted an issue of its Science and Technology supplement to "Vertical Farming: Does it really stack up?" "The world’s population is expected to increase to 9.1 billion by 2050, according to the UN. Feeding all those people will mean increasing food production by 70%, according to the UN’s Food and Agriculture Organisation..." Even if we increased food yields dramatically, they are not likely to produce nearly three-quarters more food from the same acreage. The idea of Vertical Farming is that by concentrating food production in cities, where it is needed, you will reduce emissions, slash transport and refrigeration costs and reduce spoilage. The originator of the vertical farms concept is Dr Dickson Despommier, Professor of Public and Environmental Health of Columbia University in New York. He believes that growing food in a controlled environment, in water (hydroponics) rather than soil will reduce herbicide, fungicide and pesticide use too, as well as reducing emissions and costs. The drawback to the idea is that the plants will need artificial light as they are not going to get the controlled amount of light necessary for optimal growth inside a building. However the designers in the video below are aware of this drawback and are trying to overcome the problems. There seems to be no theoretical reason why we should not grow food vertically. In 1903 few people thought that a heavier than air vehicle could fly. Fortunately a couple of brothers were too pig-headed to believe in the general consensus: Orville and Wilbur Wright. Necessity may well drive invention in the matter of vertical farms, because our society will certainly need to increase food production.